Using existing data from historic Marbled Murrelet surveys, this element of the project aims to look at murrelet occurrence at the landscape level. Key questions include, how well occurrence can predict nest success, how nests are clustered across a landscape, how much overlap occurs between murrelets and their nest predators, and how these patterns have changed over time. During the breeding season, highly trained teams capture Marbled Murrelets off the water at night with nets. Birds are carefully inspected for health and morphology. Blood is drawn for DNA analysis and to measure stress hormones. Small VHF radio transmitters are attached to the backs of birds of sufficient size. Birds with VHF radio transmitters are tracked daily for the duration of the transmitter (at least 45 days) from the air and by researchers on the ground. This element of the project allows researchers to observe where the birds are spending time during the breeding season and track any movement to nest inland. 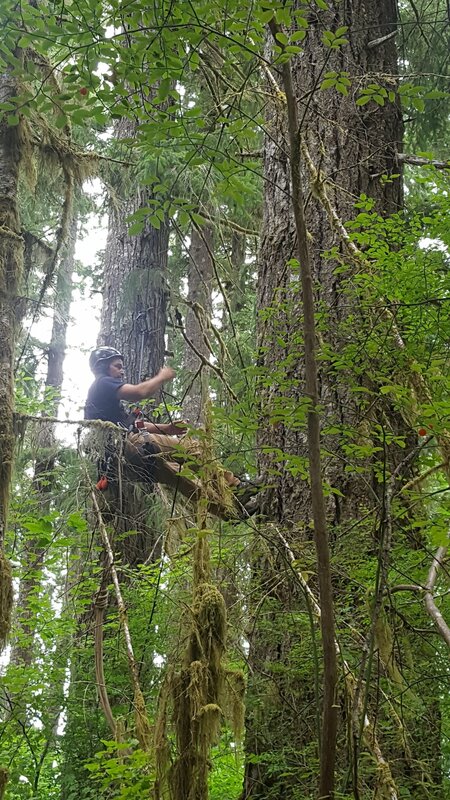 Once a tagged murrelet has been tracked inland and a nest tree identified, researchers use rope-based techniques to ascend into the forest canopy via a nearby tree for deployment of custom-built video cameras that provide an around-the-clock record of nest activity. Drones equipped with thermal infrared cameras are also being tested to determine if more efficient methods of locating nest sites can be used in the future. Through these approaches, researchers will acquire crucial information needed to recover populations, including determining where murrelets place their nests across the landscape, quantifying how often they visit nests to incubate eggs and feed chicks, and evaluating which factors determine whether their nesting attempts are successful.